But... I've had a lot of time to swatch lately so I have a lot of beauties to share! Let's get started with some KBShimmers, shall we? Oh Splat! 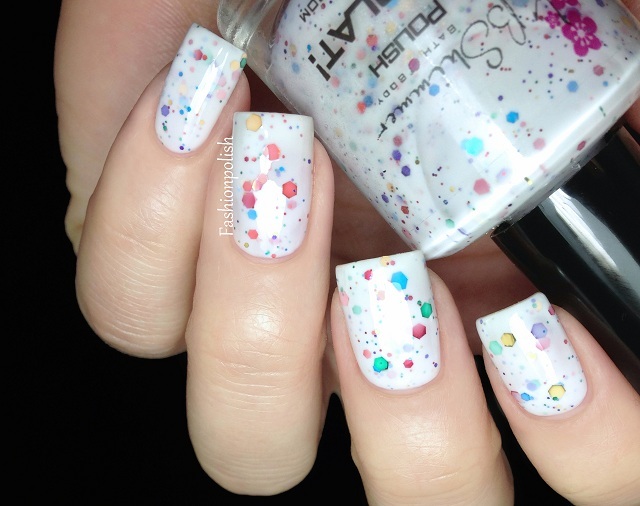 is a opaque white packed with different sizes of multicolored glitter. It was surprisingly opaque and covered perfectly in 2 easy coats, which is what you're looking at here. No glitter fishing of placement required. Berry Patch is a soft pastel mauve infused with different sizes of purple glitter as well as small pieces of holo and large blue hex glitter. Formula was, again, a pleasure to work with and applied evenly in 2 coats. 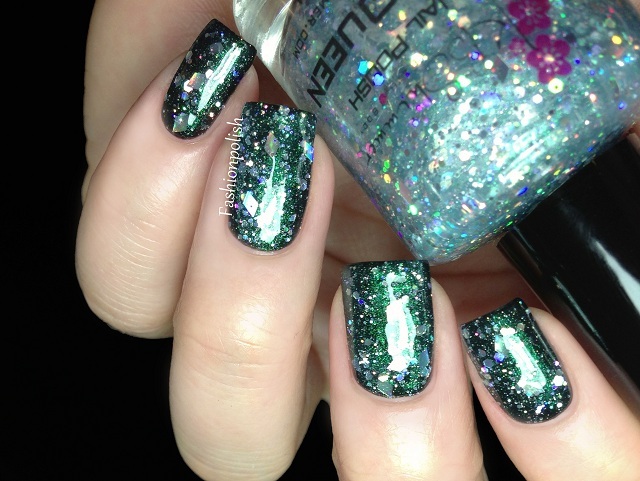 Diva is a saturated sheer purple shimmer literally packed with different sizes of holo glitters. Formula was very different from the previous two and requires 2 to 3 coats for full opacity. I would recommend using it over another purple for best results but I really wanted to show it on its own so I used 2 careful coats here (plus 2 coats of topcoat). Proud Peacock is a beautiful turquoise jelly with black, blue, fuchsia and silver glitter in different shapes and sizes. You will probably love this one even if, like me, you're not a huge bar glitter fan! I used 2 coats plus topcoat here and I like its translucent look but if you prefer your polish more opaque, you can either add a 3rd one or layer it over another turquoise. 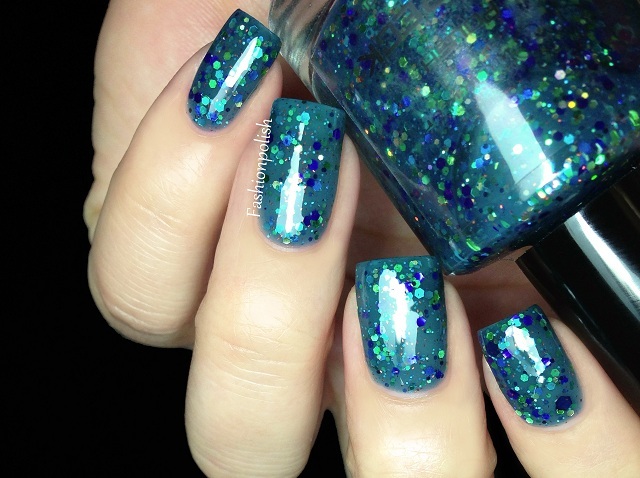 Shipwreck is a teal jelly with a perfectly balanced array of green/teal/blue as well as hints of purple glitter. Formula was very similar to Proud Peacock and I used 2 coats in these swatches but you could either go for 2 to 3 coats or layering for full opacity. I Made a Bleu Bleu is a vibrant royal blue foil-like shimmer with a subtle green shimmer, so sparkly and intense in real life! Formula was fantastic and you're looking at 2 self leveling coats plus topcoat here. 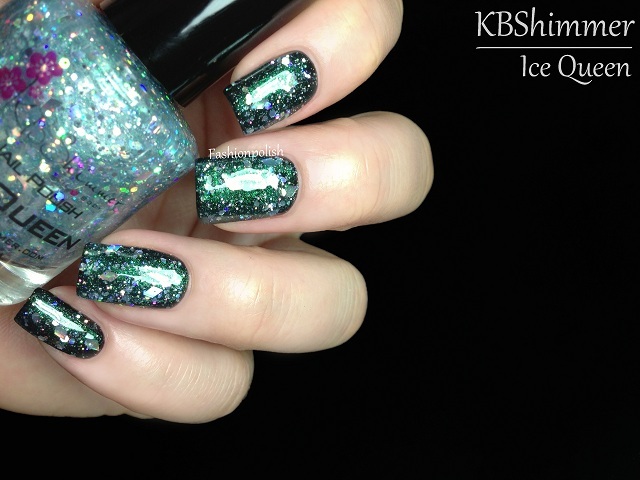 Ice Queen is a clear base with green shimmer and a ton of silver holo glitters in different shapes and sizes. I did not expect the green shimmer to be that strong but I guess the black underneath brings it out somehow. I used 1 coat over black (plus topcoat) in these swatches, no glitter fishing of placement. I really LOVED reviewing thses and I must say that I now understand all the hype around KBShimmer! The color range is extremely diversified and formulas high quality. I can't wait to show you the others ones I have! 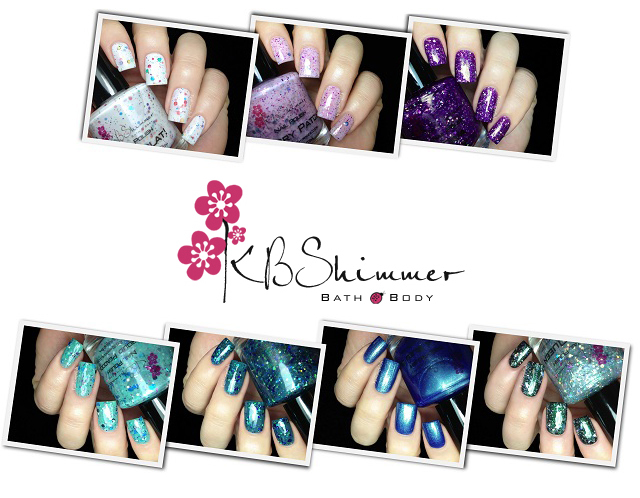 KBShimmer is 3 Free and retails for $8.75 / $9. KBShimmer can be purchased directly from kbshimmer.com or via Etsy, local stores or online at harlwoandco.org. These polishes are SO amazing!! Gorgeous swatches! Nossa apaixonei nos esmaltes com glitter, são tudo de bom. I can't get over how amazing these are! Lovely swatches! I see a couple that I want. These are so gorgeous! I want them all! Great swatches! I'm consistently blown away by your photos. Have I said that before? :) Great polish! I don't have any KB Shimmer but I need it now! Beautiful swatches!!! I only got a part of the above and now it seems I should get the other ones as well!!!! Diva and Proud Peacock are awesome :-) looking forward to seeing Part 2!!! All of them are stunning! Wow, these are so stunning. I love Berry Patch! beautiful swatches as always!!! 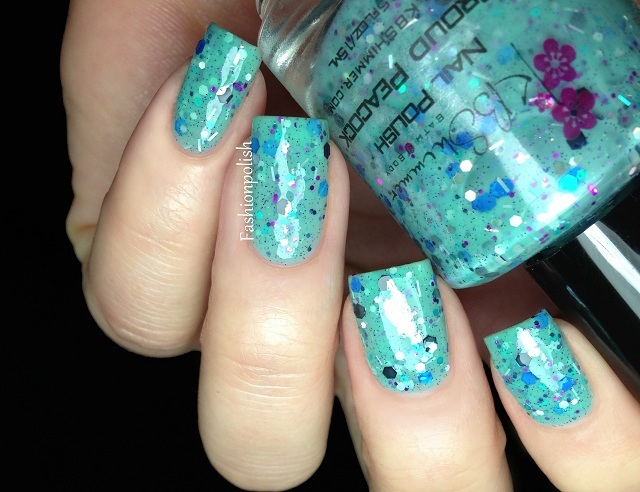 :) these polishes are so beautiful! Beautiful swatches! Diva, Shipwreck, and Ice Queen are amazing!